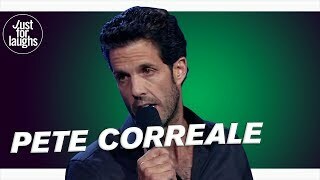 Pete Correale is a professional stand up comedian originally from New York. His comedy is reflective of his life and the experiences he’s been through. Being married for almost twenty years and having a young daughter, Pete’s never at a loss for material. With a conversational delivery and disarming regular New York guy attitude, Pete makes you feel like your listening to the funniest guy at a party as opposed to just another comedian on a stage. Combined with top notch writing skills, this has led Pete to the top of the stand up profession. Pete has performed numerous times on The Tonight Show, Letterman and The Conan O’brien show. As well as filming two of his own one hour television comedy specials. The first special-The Things We Do For Love aired on Comedy Central and was voted by Time Out Magazine as the #2 Comedy special of 2008. His second one hour special debuted on Showtime in 2016 this one titled Let Me Tell Ya. It was filmed at the famous Vic theatre in Chicago and Pete once again delivered a stellar performance. Pete has also released two comedy albums, Give It A Rest in 2010, and his second album Made For Radio which was released in June 2018 and quickly rose to number one on the iTunes comedy charts. Aside from stand up Pete has used his comedic skills in various other platforms throughout his career. As a writer he’s been hired for several projects, most recently as part of the staff on the CBS sitcom Kevin Can Wait which he did for both seasons. He also made a few guest appearances the show playing Larry the fish guy. Pete was also the co-host on a daily two hour live comedy radio show on SiriusXm titled Unleashed. He did this show with comedian Jim Breuer for four years from 2008 to 2011. And In 2012 Pete began a podcast with comedian Sebastian Maniscalco titled simply enough The Pete and Sebastian show. Starting off with a couple of microphones and an internet connection Pete and Sebastian kept at it and today the show airs every Friday afternoon on Siriusxm the Raw Dog channel before being released as a free podcast episode. Currently up to episode 310 and still going strong, the Pete and Sebastian show is one of the most popular comedy podcasts on air today and the fans have been showing their support in full force most everywhere Pete headlines.